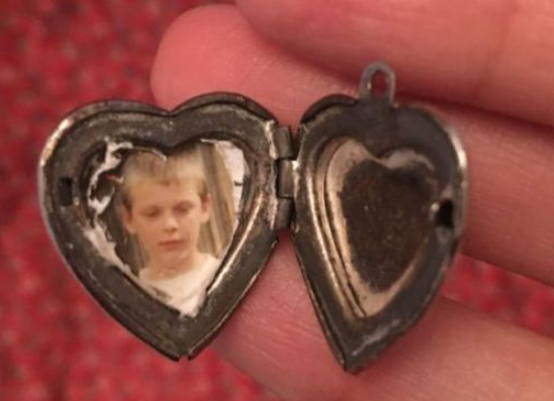 Do you recognise this locket? Or the picture of the child? A woman in Ireland is trying to reunite the jewellery and the photograph with their owner after she discovered them in a dress she bought in a charity shop. Fiona Leahy, 24, bought a vintage dress at an Oxfam shop in Dublin last Thursday. It was only when she got home that she noticed a tarnished, silver locket in one of its pockets. Opening it revealed the image of a young child. Concerned that someone accidentally gave away the locket, Fiona has appealed on Twitter asking if anyone recognises it. Many people have tried to help by sharing her post, but so far nobody has come forward with any information. Her cause has been helped by almost 1,400 retweets, including from accounts with tens of thousands of followers on Twitter. Fiona told the BBC there have been "no leads at all," although she remains hopeful of finding the owner.